When I posted a couple of Sasha's knitting doodles last week we got an amazing feedback from you, dear ladies and gentlemen (mostly ladies but let's not forget our gentlemen :-). Your support helped my almost 11 year old daughter believe that her art can bring smile to people. That was a most important revelation for her. 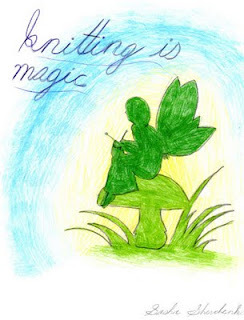 She keeps drawing more and more knitting inspired pictures and we want to share one of her recent creations with you. This drawing is magical, inspired by fairy tales Sasha is so fond of. Let us know whether you like it.